LaShaun Martin is southern born, but Cali grown. She was born in Dallas, TX, but raised in Monterey County, CA. She holds a Bachelor of Science degree in Business Management. Prior to deciding to stay home with her girls, she worked for the California Department of Corrections and General Services for 15 years. She then spent 7 years with Hewlett Packard as a Global Event Services Manager, exclusively from home. We interviewed LaShaun for this edition of women entrepreneurs and here are her answers on life and her business Shootie Girl! 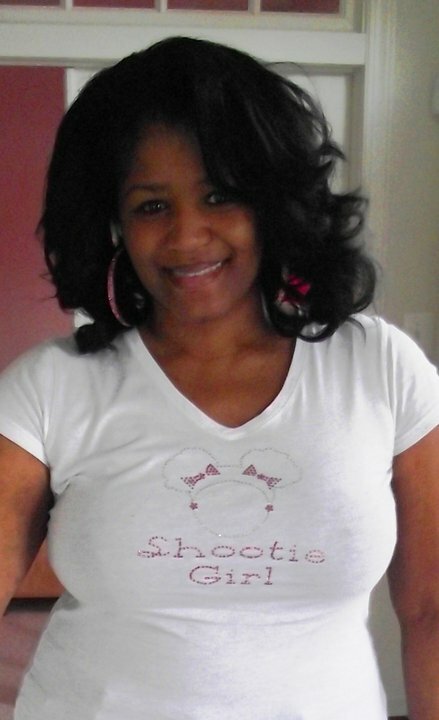 Shootie Girl™ is a custom rhinestone apparel company. Our unique tees are attention getters that spark conversation, while focusing on positive messages for women and girls. We service individual and corporate projects. The term “Shootie Girl” was created by our oldest daughter and niece at age 3. Now at age 8, they are Jr. Creative Designers for our Shootie Girls Rock – Girl Power Line, along with their younger sisters. We are based in the Maryland/DC Metro area, but our online store allows our products to be purchased from and shipped anywhere in the country. I was a work-from-home mom for corporate America for the past 7 years. But have always served a dual role as an entrepreneur. I completed a few rhinestone projects that were extremely successful. Further research revealed a void in the “custom” rhinestone apparel market, and we decided to tap into it. My consistent motivation is my family. It is important that I exemplify a standard of excellence and model “realizing your dreams” for my girls. I believe any business owner always has concerns going in. I would not call them fears, because I choose not to be moved by fear. But we were concerned that we could consistently provide a quality product that people would want to continue purchasing, especially in a down economy. The concept for Shootie Girl was developed from our oldest daughter and niece. As most little girls, they loved to dress up and look at themselves in the mirror. But these 2 little ladies took it a step further, striking cute poses and shouting “SHOOTIE GIRLS!” The “bling apparel” idea grew from there, as everyone knows women and girls love shiny things ;-). Our start-up capital was a whopping $200.00! We researched what we needed and started with the bare minimum. Sales began to flow in and we put every penny back into the business and built it to where we are now. Our biggest marketing strategy has been word-of-mouth. When our customers wear our tees, they always share complimentary feedback and inquiries from others of where to purchase them. They have been our best walking advertisement. Our Clinique Cosmetics, Carol’s Daughter, Actress Octavia Spencer from The Help Movie, CNN’s Soledad O’Brien and Sherri Shepherd of The View projects were directly from word-of-mouth advertising. Social Media has catapulted us into an amazing arena of networking and really getting our brand out there. We have developed exciting partnerships and sponsorships as a result. We consistently market on Twitter, Facebook, LinkedIn. Our new blog at www.shootiegirl.net has been a great marketing tool as we focus on positive topics for women and girls. We are a family owned business with one staff assistant. We are looking to hire more staff in the near future, as we continue to grow. Our staff must have the same motivation and quality standards that we have to be a good fit for our team. We love seeing the finished product and the feedback from our customers and corporate clients. We are just as excited as they are when we create something new, on the cutting edge, and eye catching for the consumer. Working with my husband and watching our girls during the creative process is fun. We see the girls’ wheels turning as they draw and create new ideas to add to our catalogue. Designing NEVER gets old, and keeps us motivated in what we do. Balancing life as a working wife and mother requires daily strategic planning. Some days are better than others. But the flexibility of being a business owner allows me to spend the day in the classroom or on a field trip with my girls, or to take a few hours off in the middle of the day to have lunch with my husband. We MAKE time for what’s most important. Family always comes first. Certainly be careful about jumping into this or any other business venture without doing your research and homework. Know everything you can about the business before taking the leap. Also, be sure to have your legal and financial management house in order from the start. It’s very difficult to go back and establish those things once you’re already rolling. Yes, your readers can enter the following giveaway. All they have to do is follow us on facebook, Twitter, and our blog! Simply follow the instructions and enter! The drawing ends on January 31, 2012! The winner will win a Shootie Girl “Diva” shirt! Hurry up and enter!!! CHECK OUT SOME SHOOTIE GIRL DESIGNS! I love the “Natural Girl” Design!! I like that one, too Nicole Stith! Did you enter to win??? It’s at the bottom of the blog article. Did you see the raffle at the bottom? I did it!! I hope I win! HI, I have been inquiring about the winner of this contest without any success. If you picked the winner would you mind telling me who it was. I apologize for posting here but I am unsure of how else to reach you. I have asked repeatedly how the winner of this contest is and I have never been able to get an answer. Shootie Girl has informed me that this contest is your responsibility. That I should be getting my answer from you. So again, almost 5 months after the contest, I am requesting the name of the winner. Nevermind………. I see in re-reading this article it was Shootie Girl’s promotion. My sincere apologies to you. make sure you sign enter the raffle to win that rhinestone tee shirt!!! I ENTERED!! I need that fab @40 since that is exactly what I will be in July!! But I love them all. So glad that MochaMoms turned me on to your wonderful designs. These t-shirts are so cute. I’m trying to come up with some ideas for my own home-based business. Being able to work from home and spend more time with my loved ones is very important to me. Rhonda Harris-Judie–hey, lady! Please enter the raffle. Click on the article and at the bottom enter the contest. It’s super easy! Let’ support one another!! !